Northern Duct Services is an Indoor Air Quality (IAQ) service company that strives to provide your home with a clean, healthy, and more efficient air handling system and provide a high level of customer service. We’ve been servicing the Northeastern Iowa area homeowners and businesses since 2012. 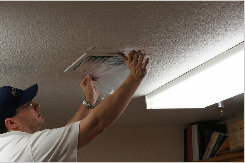 Our dedicated team of professionals are trained and licensed to do Aeroseal residential air duct sealing technology, air duct cleaning and dryer vent cleaning. This ensures they have the knowledge required to provide your home with the level of service and air quality you and your family expect and deserve. My wife and I build a new walk out ranch in 2010. Since that time we have had a difficult time keeping two of the upstairs rooms as warm as the others. We have also had a difficult time with excessive dust throughout the home. We could dust but the next day it looked as if we hadn’t. We researched for possible solutions and found that Aeroseal may be the cure to our issues. We contacted Northern Duct Seal (NDS) to complete the sealing of out ductwork. After NDS completed the Aeroseal process, both our issues were remedied to our satisfaction. The two rooms are now much warmer and now we only need to dust less than weekly. In addition, my automated thermostat indicates less furnace run time post sealing compared to pre sealing, and is now running more efficiently. Northern Duct Seal did a fantastic job and were very professional throughout their time in our home. They provided all the answers to my questions and helped solve our HVAC issues. Thanks NDS! We had Northern Duct Services seal the interior duct linings of our home and have seen tremendous reduction in leakage, increases in air flow and temperature stabilization. Our HVAC systems run less and the house has less dust. Overall a pleasant and cost effective experience. We totally can tell a difference in the warmth of the rooms further “down the line”. Rooms are warmer themselves, but also the whole house feels to be a more balance warmth as well. The other thing we can notice is the amount of dust is considerably less. Prior to sealing, we would dust and the next day we could dust again. No the case any longer. Dusting “lasts” much longer now. House therefore feels much cleaner as a result. I installed an ecobee smart thermostat that is capable of providing reports of the efficiency of our HVAC. The report generated since sealing our duct work indicated less furnace running time than before sealing. I am pleased with that as it was much colder after the sealing was completed and the furnace still ran less than pre-seal.